When he first emerged on the local Dancehall music scene back in 2004 he was still in school and called him self ‘Sinister.’ He was introduced by a close friend to an industry personnel to “make things happen”, but he was still in school about to sit his final year exams. He was advised to “finish up, complete the exams and return” he did just that and more determined than he ever was. April 2005, Bramma’s music first hit the Dancehall scene in Miami which became one of the first places young Bramma got some love. His manager who had gone there to work for Togetherness Records and with the assistance of a dj called Shams from that camp launched the promotional campaign. The internet also became an excellent medium from which to network; so they made good of the opportunities created hitting sound system and radio djs far and wide. It worked! Daddy English of Benevolent International in the United Kingdom and Jan Haze from Sensi Movement in Germany are just two of the many djs that assisted in creating an underground base in certain Dancehall saturated UK and Europe markets. The feedback was encouraging but back home, BRAMMA was still unknown. In 2006, and the Bramma was not getting enough studio time to record it was a challenging time plus personal family issues that involved the death of a loved one took a toll on young Bramma and his mother, Myrna Brammer. Through it all, the young deejay held on to his dream. Management had returned to Jamaica and the Marley/Sophia/Bramma team reunited and hit the streets in an effort to get the attention of the Jamaican audience. It was during this time that Marley’s family moved to a new address in Kingston, close in proximity to the studios of Big Ship. On one of his visits to Marley’s, BRAMMA met Steven McGregor. Steven worked with Bramma and his crew, both were young and eager to make music. Bramma’s first official recording was on what could have been Steven’s first official production, called the ‘Cartoon rhythm.’ The experience was great, young Bramma nurtured his craft at Big Ship, there he learnt much and had come to know and respect the head of the Ship, Freddie McGregor who motivated and encouraged him to work on his craft while reminding him that only good music last forever. BRAMMA spent many nights in Big Ship studios not wanting to be left off a new rhythm or because it was too late to go home, he had no transportation. Steven’s credibility grew with his innovativeness so when the young producer created the, Powercutt riddim, a young dj, hungry for a break, brought to life the very first track that created his first official buzz within the local industry, the track was called “Last Man Standing.” The track got much attention as it had come during a time when all hell broke loose between Vybz Kartel and the Bounty Killer lead Alliance. Vybz Kartel broke away from Bounty Killer’s Alliance group to form his own and many artistes started taking sides. Many artistes except BRAMMA, who though had been approached to join a particular side refused and made it known with his shot at the riddim. He held his own, stood his ground and vowed that at the end of the war he would be the “Last Man Standing”. While the song created an impact on the industry and prompt Bramma to create other war type tracks which was good for making money from dubplates, Bramma’s team decided that it was too early in his career to create limits as to what he was able to do. He wanted to explore Reggae and Dancehall and this he made known when he released another attention grabber track called, ‘Heading to the Top’, on the Party rhythm produced by Steven McGregor. The buzz began in Jamaica but the feedback on the outside was even greater, a follow up video helped ‘stepped things up a notch’ and success looked inevitable. Early 2007 Bramma met Jordan McClure of Chimney Records another young producer and recorded his first single. The track entitled, “Value of a Lady” gave Bramma his first major international buzz. 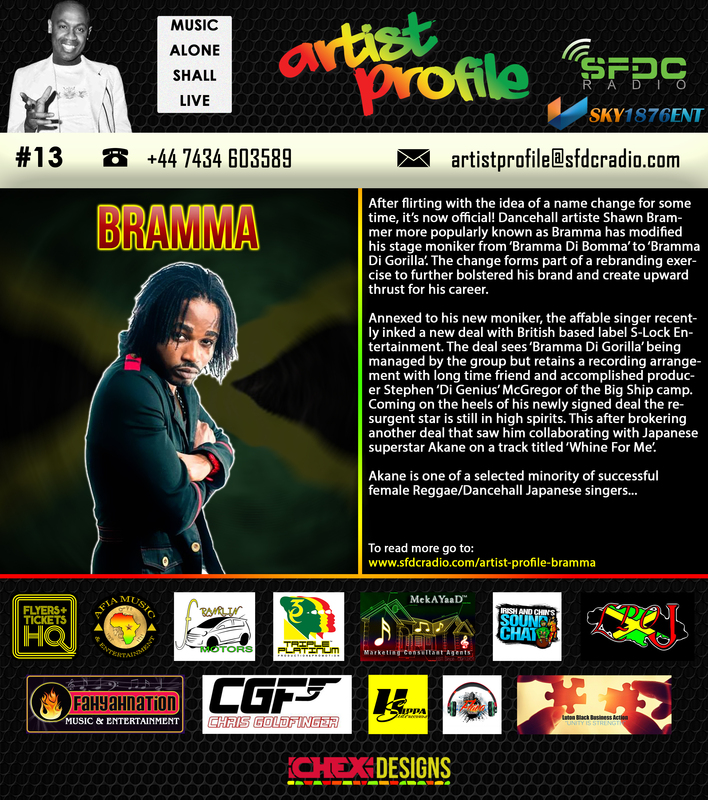 Bramma made a full page feature in the November 2007 issue of Riddim Magazine, which is by far, the most important magazine with a worldwide readership, published both in a German version released across Germany, Switzerland and Austria. An agreement between Bramma’s management and the magazine’s Pete Lilly, saw to the distribution of bonus copies of Value of a Lady on cd and included in the issue hit stands worldwide. December 2008, Bramma did his first individual tour of Europe. He performed in Amsterdan, Rotterdam in Holland, Cologne, Bon Germany and Berlin in Germany and France before returning to Jamaica to perform on STING dubbed the greatest one night Reggae/Dancehall show on earth. Around 2009, Bramma signed a management contract with Steven McGregor. Both accomplished much; Bramma performed across Europe, Canada, Africa and the United States while he continued putting out music that have impacted different regions across the Reggae/Dancehall music scope. Summer 2012, Bramma signed a second management agreement between S-Lock Entertainment and Steven McGregor. S-Lock Entertainment a London base company with a base in Jamaica identified Bramma as a potential Reggae/Dancehall star hence their interest in undertaking certain “management aspect” of his career. 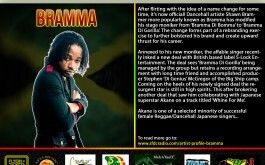 Moving forward, touting a new slogan, ‘Bramma Da Gorilla‘ that best identifies his Dancehall persona, S-Lock Entertainment and Steven McGregor now look forward to putting out Bramma’s debut album early 2013. While Bramma’s work on the album, he is preparing for his third European tour scheduled for January 2013 with his Big Ship crew.